SysInfoTools Email Converter helps users convert their email files of MS Outlook and Outlook Express into other file formats such as: DBX, PST, EML, MSG, HTML and RTF. It enables users to open their DBX files of Outlook Express in MS Outlook and PST files of MS Outlook in Outlook Express. The software can quickly convert all the selected emails files into defined file format. The process of email conversion is very safely executed by Email Converter software without affecting original Meta-data of email files. The professional Email Converter software smartly works with all versions of MS Outlook and Outlook Express. It does not require any prior technical knowledge as it works in self-describing mode. Therefore, any technical or novice user can comfortably use it. SysInfoTools Email Converter becomes very helpful in these situations: 1. If a user is not familiar with its current email platform or has changed it, for example: from Outlook Express to MS Outlook or vice-versa. 2. MS Outlook ANSI PST file (MS Outlook and earlier) has a limited file size of 2GB. If the size gets increased, then it may become corrupted or inaccessible. 3. Archive emails for future references in a better and known portable email format other than propitiatory DBX or PST format. A DBX file of Outlook Express cannot be opened in MS Outlook or a PST file cannot be opened in Outlook Express. You must convert their file formats before you open them, otherwise they may get corrupted or become inaccessible. In such situations you must use SysInfoTools Email Converter to convert your email files or you may try its demo version first. Salient features: 1. 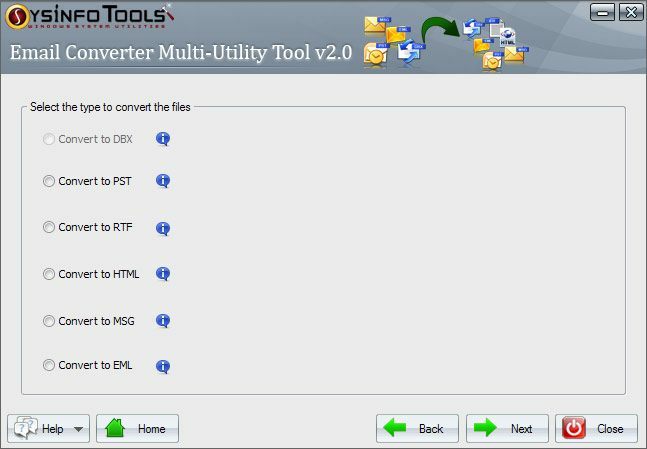 Converts DBX, PST, MSG and EML to DBX, PST, MSG, RTF and HTML. 2. Saves the LOG file of email conversion process separately. 3. Supports all versions of MS Outlook and Outlook Express. 4. Convert in a better and known portable email format other than propitiatory DBX or PST format. 5. Free demo version is available. This site does not contain serial number, crack, keygen SysInfoTools Email Converter serial number : serial number is the simplest type of crack. A serial number(cdkey,product key,etc) is register the program as you may already know. a crack or keygen may contain harmful software. If you cannot find the exact version you want, just give it a try. for more information read .nfo/.txt/.diz file include in zipped file.